Weeping Willows by S. B. Rose, e-book, novella, 50 pages, published in 2015. Suzie Edwards is an English major at college, living with her best friend, Melly. When Melly disappears, her boyfriend Craig is the prime suspect. Suzie is still waiting for news of her friend when her parents die suddenly. Are the two incidents related? 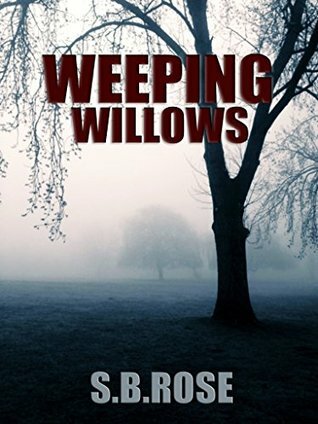 Weeping Willows is a quick read with a nice premise. The story has potential, however, the writing requires a lot of polishing. It was riddled with errors, and for some reason my copy was missing quite a number of ‘l’s, especially the second ‘l’ in words like Melly or chilling. This is probably to do with the conversion of the file, but I found it very annoying. There were some grammatical errors as well, but many of the mistakes were one word misplaced for another, such as ‘winching’ instead of ‘wincing’. It interrupted the flow of the story, and is evidence of a lack of editing. Spell-check is simply not enough. I think an extra draft or two could really make a difference here. I usually like mysteries, but I found myself drowsing whilst reading this. The blurb sounded exciting, but it didn’t reach my expectations, it was only something to pass the time. I didn’t connect with any of the characters, and therefore had no investment in what happened to them. There wasn’t any suspense, and I was disappointed that Suzie didn’t even try to escape her fate. She was a weak and annoyingly boring character. I’m also a little confused about the start of the story, as Suzie remembers something from her childhood that seems to have no bearing on the rest of the story. There was no explanation as to how her family went from poverty apartments to a wealthy neighourhood, perhaps I missed the importance of that. Weeping Willows is suitable for middle high school students and up.